ni giveaway Craftmerahjambu yg pertama tau..
so rase mcam nk join je..
1. be follower in blog & facebook (Craft Merah Jambu) = DONE!! 2. Click the 'like' facebook button = DONE!! or anything about crafting sewing = DONE!! 4. 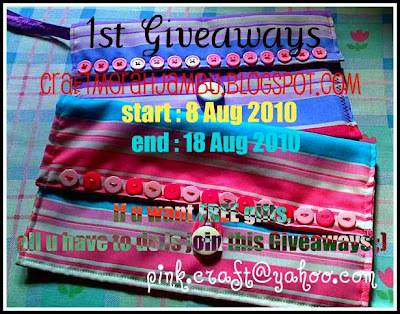 You must write about this blog's giveaway at your own blog and include the pictures of Craftmerahjambu's giveaways time. You also must link my blog in your post! = DONE!! 5. Don't forget to write your name, email address and URL link of your blog post & your home address (to post the gifts if u are the lucky winner ;)) = DONE!! tq 4 participate my 1st giveaway! Please visit our Blogshop to join another giveaway!